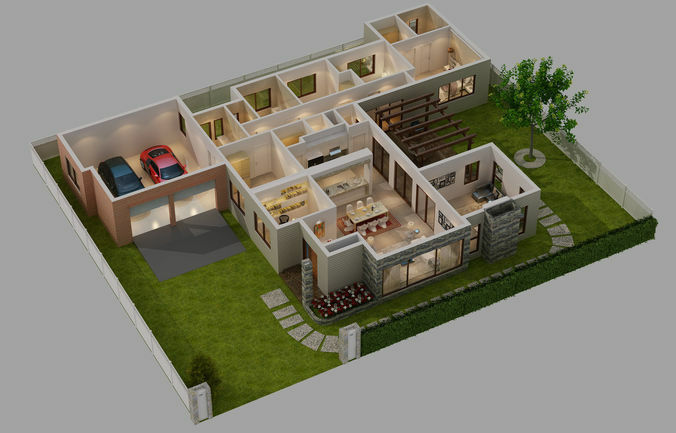 -3D Models cutaway house contain : lobby ,living room, bedrooms and kitchen with dining room in modern design , garden, garage, car ..... can easily hide or unhide roof if needed. -all 3d models are design from cataloge with alot of modern furnitures -all done with 3dmax 2009 and render with vray 1.5 sp2 and a scanline version of this model. You need 3dsmax and vray to render exactly like preview. fbx and C4ds file contain will full textures. Thank you ! Every format of this model has been verified in software that is designed for.Also check out my other models, just click on my user name to see complete gallery.